We are teaching mobile phone programming within Computer Science departments in ten Sub-Saharan African countries including: the University of Nairobi (Kenya), Makerere University (Uganda), GSTIT (Ethiopia), Ashesi University (Ghana), and the Kigali Institute of Science and Technology (Rwanda). There will always be tasks that humans can do better than computers. Our txteagle system distributes and collates this work via SMS. This empowers the billions of mobile phone subscribers to earn small amounts of money by completing short text-based tasks. We have also been offering "SMS Boot Camps" at many universities across East Africa. This is a project-based course enabling teams of students to launch and market their own SMS services to the millions of mobile phone users in their own country. Today’s mobile phones are designed to meet Western needs. Subscribers in developing countries, however, now represent the majority of mobile phone users worldwide. We believe the adoption of new technologies and services within this vast, emerging market will drive innovation and help shape the future of the developing world. Read our newsletter and ACM Interactions article, "Mobile Phones and African Entrepreneurship"
See the latest photos from our mobile phone programming courses. Listen to the recent story about EPROM on the CBC radio program Spark. Watch the EPROM video commisioned by Nokia as a Forum Nokia Success Story. 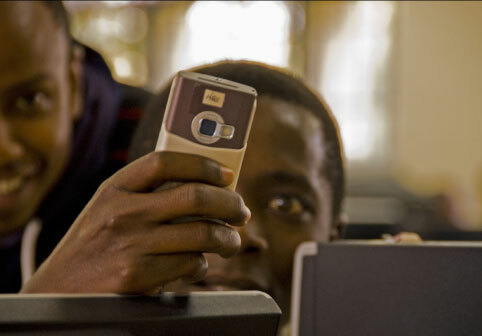 Africa is currently the fastest growing mobile phone market in the world. Over the past five years the continent's mobile phone usage has increased at an annual rate of 65% - twice the rate of Asia.